This production transferred for a two-week season at the Exeter Northcott Theatre, where the main stage was transformed into an in-the-round space. Dominic Power provided a version of the play that introduced Antipholus of Ephesus earlier than in Shakespeare’s original and introduced a number of songs. ★★★★★ The Sunday Times Andrew Hilton’s production is a revelation. This early play is more than a comedy. Voltaire announced that Shakespeare was a barbarian because his tragedies had comic scenes; the great Gallic sage would have been appalled to see a shadow of fear hung over this improbable story. Will poor old Egeon (David Collins) be executed? Can you laugh at Adriana (Dorothea Myer-Bennett) when her husband publicly humiliates her? Or at him (Matthew Thomas) when she humiliates him? The young Shakespeare already knew that life was a two-way game: laughter in the dark, love your neighbour, but don’t trust anyone – not our contemporary, but speaking like one. The two Dromios are comic-heroic victims, looking as eerily alike as their tormented masters. ★★★★ The Guardian From the opening moments, cordially announced by a violin and piano, there’s an air of restraint about Andrew Hilton’s approach to Shakespeare’s early, and rather boisterous comedy. And how welcome this is if you’ve ever suffered a slapstick take on the play, in which two pairs of twins are separated and collide again without meeting until the play’s denouement. The comedy comes from the way that collision ripples out into unknowing people’s lives, and the errors it triggers. Done Hilton’s way, with a taut grip on the pace, these are rendered delightful as they unfold. As ever with this tremendous company, Shakespeare’s language is given top billing. Lines that get lost in heavy-handed productions shine here, and are given time to unfurl. Hilton’s cast wring every last laugh out of the errors, and you may notice comic nooks that more bombastic productions lose. Kate Kordel’s courtesan, tempting Dan Winter’s Antipholus of Syracuse, is gorgeously laden with innuendo in every line; Nicky Goldie’s Abbess a feisty hoot. Other highlights include Richard Neale’s Dromio of Syracuse, recoiling hilariously from the advances of a servant in Antipholus’s house (“she is the kitchen wench, and all grease”) and Dan Winter as his brilliantly befuddled master. The Financial Times In contrast with the increasingly frenetic action that ensues, The Comedy of Errors has what may be the slowest opening scene in all of Shakespeare. Old Egeon’s account of how these two pairs of identical twins have ended up, unbeknown to each other, in the same city resembles the “Previously . . . ” montage at the top of a TV drama serial. However, Andrew Hilton’s second production in this year’s Shakespeare at the Tobacco Factory season keeps the pace sprightly from the word go. This, plus judicious trimming, brings the entire saga in at two hours, including interval. Yet it doesn’t feel rushed (except when Dorothea Myer-Bennett’s Adriana deliberately gabbles her final petition to the Duke for comic effect). Script editor Dominic Power even finds space to add a few pastiche-period musical numbers sung by twin manservants the Dromios. I am unconvinced by Hilton’s decision to have these characters play in received pronunciation; as with almost all of Shakespeare’s clowns, a plebeian twang gives the lines more of a zip. But these shaven-headed Dromios are smart lads. As Dromio of Syracuse, Richard Neale turns a series of worn-out gags about baldness into a gentle twitting of his splendidly coiffed master, Dan Winter. Hilton is experienced at getting the job done on a shoestring. The Tobacco Factory’s in-the-round stage is bare throughout, save for the Duke’s desk in the opening scene; Harriet de Winton dresses the cast in unshowy Edwardian costumes (the swords, which often look incongruous when a play is relocated in time, are elegant sword-canes); so everything rests on inspired performance interpretations. The Morning Star Shakespeare’s first play is often treated as pantomime. Timeless characters are lost in a veritable nightmare confusion as two sets of identical twins disrupt their own lives and those of the people around them. Yet lurking beneath the surface of the hilarious comedy of mistaken identities is a dangerous reality. Director Andrew Hilton characteristically sets his production in a clearly delineated Edwardian world with only the nod of a fez to a more exotic Turkish environment. As always he lets the text speak for itself, only giving the farce its head in the second-half climax. As the action accelerates into a manic spiral he and his cast negotiate the complex wordplay with commanding ease, revealing the hidden human fear of not knowing who we are. Dan Winter and Matthew Thomas as the Antipholus twins stumble through the muddled maze with increasing hysteria. If their masters find their own unwanted split identities frightening, Richard Neale’s and Gareth Kennerley’s Dromio twins – their respective put-upon servants – accept their regular chastisement with a plaintively mystified resentment. Dorothea Myer-Bennett’s bewildered wife Adriana and her sister, Ffion Jolly’s Luciana, desperately seek some feminine meaning in what appears to be a masculine madhouse. 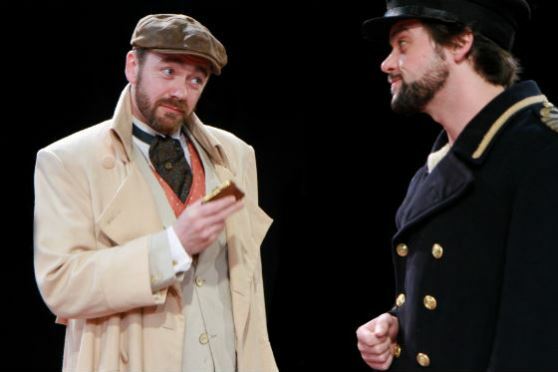 The Stage Shakespeare at the Tobacco Factory designer Harriet de Winton has added a touch of Edwardian style to this engaging version of the Bard’s shortest play. Cravats and waistcoats help disguise the two sets of twins at the heart of the multitude of mistaken identities that decorate so many of his comic plots. Attire apart, artistic director Andrew Hilton resists the temptation to treat this early work as pure farce. He never forces the laughs, relying on the near-perfect comic timing of his 16-strong cast rather than any descent into slapstick. Nor does Hilton downplay the hurt at the heart of the comedy, resolved right at the end by the moral message that marriage is sacrosanct and should be celebrated as such. The Antipholus and Dromio sets of twins are played by Dan Winter and Matthew Thomas, as two increasingly bewildered young sophisticates, with Richard Neale and Gareth Kennerley as their browbeaten but indestructible servants, whose miraculous meeting at the end unifies the mix of laughter and near-tragedy. Dorothea Myer-Bennett is a sexually eager Adriana, constantly puzzled at her husbands seeming loss of interest, while Ffion Jolly’s sister-in-law Luciana, in contrast, is well aware of the nature of domestic bliss. Plays International Shakespeare at the Tobacco Factory’s second production of the season, The Comedy of Errors, was the big event in Bristol: a wonderfully energetic and entertaining interpretation of a play that can sometimes seem more cruel than funny. In fact there’s nothing amusing about the story for any of the characters, who become progressively more irate, berated, and beleaguered – it’s the privileged information of the audience that transforms the action into hilarious farce. The Comedy of Errors is one of Shakespeare’s early plays, and may have been his first comedy. It is based on a play by Plautus – Menaechmi – and demonstrates Shakespeare’s familiarity with Roman comedy, studied and acted out (in Latin) in all good boys’ grammar schools in Elizabethan England. What this classical background, and the intricacies of its farcical plotting, have tended to disguise is how integral the play is to Shakespeare’s later work, how it explores themes that will remain with him to the end of his career – estrangement, both physical and emotional, the loss of siblings, parents, children, husbands and wives, whether by chance (so often by shipwreck) or by murderous jealousy; these recur and develop, through Twelfth Night and As You Like It to Othello, King Lear, Pericles, Cymbeline, The Winter’s Tale and The Tempest. The presence of the sea, and the confusion created by two sets of identical twins are central to this play. Though Shakespeare was an inland boy, the imagery of the sea is always powerful in his work; the sense of its vastness and its capacity to erase human life from the physical record, leaving only a torturing absence in the ‘tablet’ of memory. And he was himself the father of twins, a boy Hamnet and a girl Judith. Hamnet died in 1596 at the age of 11 – after the composition of The Comedy of Errors but before Twelfth Night, the play which reunites the twins Viola and Sebastian after they have both believed the other to be lost at sea. The Comedy of Errors had its first recorded performance in December 1594, but may have been written anything up to five years earlier and could be his earliest surviving play, predating even Love’s Labour’s Lost and the Henry VI trilogy. Shakespeare’s primary source was Plautus’ Roman comedy, Menaechmi, which Shakespeare may have read in the original Latin at school or in an early English translation by William Warner. He also borrowed from another Plautus play, Amphitruo, and probably took inspiration from the story of Apollonius of Tyre in John Gower’sConfessio Amantis. The play was not published, as far as we know, before it appeared as the fifth play in the 1st Folio of 1623. Shakespeare changed the setting of this play from his source text – Plautus’ Menaechmi. Plautus had chosen Epidamnum, a port in the Adriatic in present day Albania. Shakespeare moved the action east to Ephesus, in present day Turkey. For the Elizabethan audience, more than for many of us, Ephesus was famous as the destination of one of St Paul’s epistles. With its biblical familiarity and its rich and shifting religious history, perhaps Shakespeare felt it a more fitting site for the play’s themes and concerns; for when Paul arrived in Ephesus in 52 AD, he found it in thrall to the cult of Diana (her temple there was considered one of the seven wonders of the ancient world) and home to Hellenistic worshippers of magic, mystery and astrology. These ancient religions hang in the air of Shakespeare’s Ephesus – a place, Antipholus of Syracuse reports, full of ‘dark-working sorcerers’ and ‘soul-killing witches’ – and thus provide an apt location for the strange confusions that the tale unfolds. Paul’s epistle was intended to instruct the town’s inhabitants (Heraclitus, himself an Ephesian, said ‘their morals were lower than animals’) as to how they might best fulfil God’s will and live worthy, Christian lives. Much of his advice is reflected, asserted, and at times contested in The Comedy of Errors’ plot and central relationships. Most obvious is the play’s nod to Paul’s now controversial domestic code. While Adriana alternately laments and rages over her estranged husband, Luciana appears to advocate Paul’s instruction – ‘Wives, submit yourselves unto your husbands, as unto the Lord’ – as she chides her sister for her impatience. Similarly, Paul’s demand that servants ‘be obedient unto them that are your master’ is put to comic test in Shakespeare’s play as the plot escalates, confusions mount, and the dutiful Dromios are met with ever-more baffling – and bruising – circumstances. MENECHMUS. Surely Messenio, I think Sea-fairers never take so comfortable a joy in anything, as when they have been long tost and turmoyld in the wide seas, they hap at last to ken land. SERVANT. I’ll be sworn, I should not be gladder to see a whole Country of mine own, then I have been at such a sight. But I pray, wherefore are we now come to Epidamnum? Must we needs go to see every Town that we hear off? MENECHMUS. Till I find my brother, all Towns are alike to me: I must try in all places. SERVANT. Why then let’s even as long as we live seek your brother: six years now have roamed about thus, Istria, Hispania, Massylia, Ilyria, all the upper sea, all high Greece, all Haven Towns in Italy, I think if we had sought a needle all this time, we must needs have found it, had it been above ground. It cannot be that he is alive; and to seek a dead man thus among the living, what folly is it? MENECHMUS. Yea, could I but once find any man that could certainly inform me of his death, I were satisfied; otherwise I can never desist seeking: Little knowest thou how near my heart it goes. SERVANT. This is washing of a Blackamore. Faith let’s go home, unless ye mean we should write a story of our travail. MENECHMUS. Sirra, no more of these saucy speeches. I perceive I must teach ye how to serve me, not to rule me. SERVANT. Ay, so, now it appears what it is to be a servant. Well yet I must speak my conscience. Do ye hear sir? Faith I must tell ye one thing, when I look into the lean estate of your purse, and consider advisedly of your decaying stock, I hold it very needful to be drawing homeward, lest in looking your brother, we quite lose ourselves. For this assure yourself, this Town Epidamnum is a place of outragious expenses, exceeding in all riot and lasciviousness: and (I hear) as full of Ribaulds, Parasites, Drunkards, Catchpoles, Cony-catchers, and Sycophants, as it can hold: then for Courtesans, why here’s the currantest stamp of them in the world. Ye must not think here to ’scape with as light cost as in other places. The very name shows the nature, no man comes hither sine damno. MENECHMUS. Ye say very well indeed: give me my purse into mine own keeping, because I will so be the safer,sine damno. MENECHMUS. Because I fear you will be busy among the Courtesans and so be cozened of it: then should I take great pains in belabouring your shoulders. So to avoid both these harms, I’ll keep it myself. SERVANT. I pray do so sir, all the better. CYLINDRUS. [Aside] I have tickling gear here yfaith for their dinners. It grieves me to the heart to think how that cormorant knave Peniculus must have his share in these daintie morsels. But what? Is Menechmus come already, before I could come from the Market? – Menechmus, how do ye sir? How haps it ye come so soon? MENECHMUS. God a mercy my good friend, doest thou know me? CYLINDRUS. Know ye? no not I. Where’s mouldichappes that must dine with ye? A murrin on his manners. MENECHMUS. Whom meanest thou good fellow? CYLINDRUS. Why Peniculus worship, that whorson lick-trencher, your parasitical attendant. MENECHMUS. What Peniculus? what attendant? My Attendant? Surely this fellow is mad. SERVANT. Did I not tell ye what cony-catching villains you should find here? CYLINDRUS. Menechmus, hark ye sir, ye come too soon back again to dinner, I am but returned from the Market. MENECHMUS. Fellow, here thou shalt have money of me, go get the priest to sacrifice for thee. I know thou art mad, else thou wouldst never use a stranger thus. CYLINDRUS. Alas Sir, Cylindrus was wont to be no stranger to you, know ye not Cylindrus? MENECHMUS. Cylindrus, or Coliendrus, or what the divell thou art, I know not, neither do I care to know. CYLINDRUS. I know you to be Menechmus. MENECHMUS. Thou shouldst be in thy wits, in that thou namest me so right, but tell me, where hast thou known me? CYLINDRUS. Where? even here, where ye first fell in love with my mistress Erotium. MENECHMUS. I neither have Lover, neither know I who thou art. CYLINDRUS. Know ye not who I am? Who fills your cup & dresses your meat at our house? SERVANT. What a slave is this? That I had somewhat to break the Rascal’s pate withall. MENECHMUS. At your house? – when as I never came in Epidamnum till this day. CYLINDRUS. Oh that’s true. Do ye not dwell in yonder house? MENECHMUS. Foul shame light upon them that dwell there, for my part. CYLINDRUS. Questionless, he is mad indeed, to curse himself thus. Harke ye, Menechmus. CYLINDRUS. If I may advise ye, ye shall bestow this money which ye offered me, upon a sacrifice for yourself: for out of doubt you are mad that curse yourself. SERVANT. What a varlet art thou to trouble us thus? CYLINDRUS. Tush he will many times jest with me thus. Yet when his wife is not by, tis a ridiculous jest. CYLINDRUS. This I say, Think ye I have brought meat enough for three of you? If not, I’ll fetch more for you and your wench, and Snatchcrust your Parasite. MENECHMUS. What wenches? what Parasites? SERVANT. Villain, I’ll make thee tell me what thou meanest by all this talk. CYLINDRUS. Away Jack Napes, I say nothing to thee, for I know thee not, I speak to him that I know. MENECHMUS. Out drunken fool, without doubt thou art out of thy wits. CYLINDRUS. That you shall see by the dressing of your meat. Go, go, ye were better to go in and find somewhat to do there, whiles your dinner is making ready. I’ll tell my mistress ye be here. Please click on the button below to view adapted text on our Resources page.